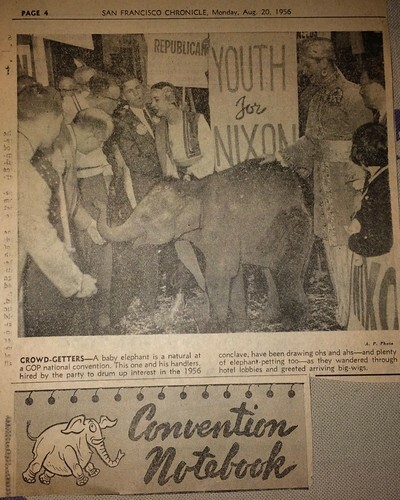 I grew up knowing about Dolly, the baby elephant my parents took care of during the August 1956 Republican National Convention. I was sad today to learn the end of her story. 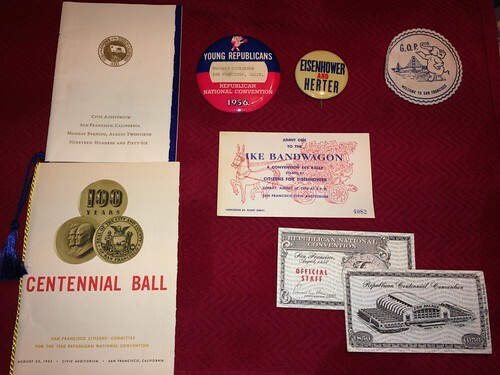 I have been looking through a family treasure box recently and came across a folder of newspaper clippings from 1956. 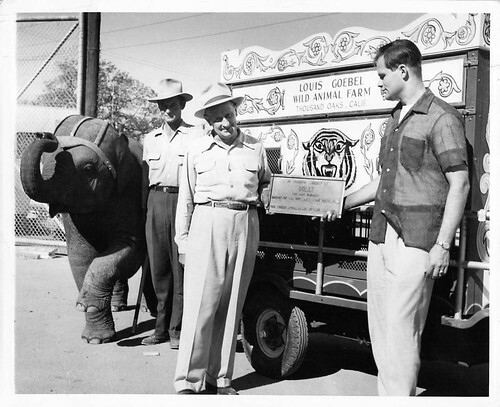 Some I had seen before – of my parents dressed in Indian finery escorting Dolly, an eight month old elephant from the Louis Goebel Wild Animal Farm in Southern California. 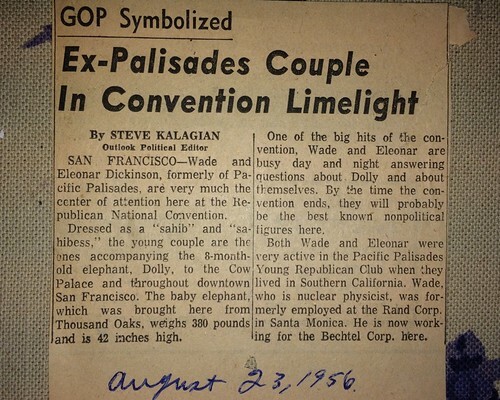 There were cheerful news stories from New York, Chicago, Pacific Palasades, my mother’s hometown of Knoxville, Tennessee, as well as from the San Francisco Bay Area. 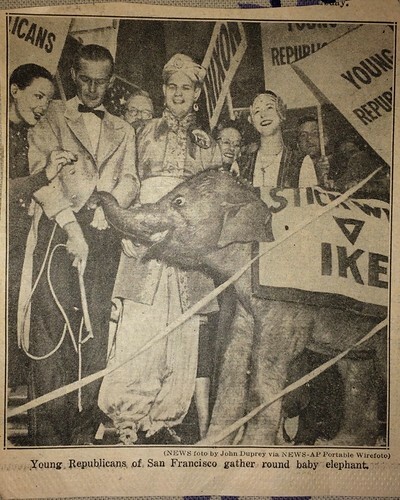 Dolly as the symbol of the Young Republicans, went to all of the convention social events and even greeted President Eisenhower (who was successfully re-elected several months later). 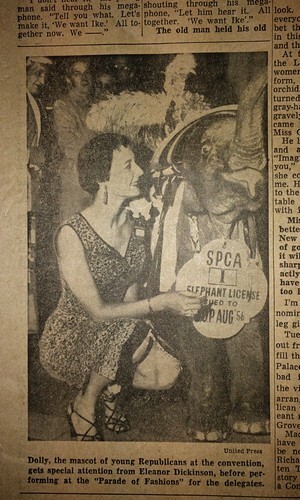 She was usually pictured wearing her big “Elephant License 1” from the Society for the Prevention of Cruelty to Animals (SPCA). It was a shock to come upon two final news stories about how Dolly was killed in a traffic accident when the truck taking her home from San Francisco overturned. 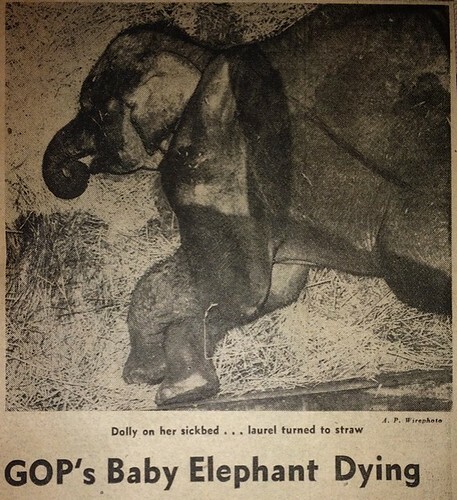 She died near Watsonville, California, in need of a blood transfusion and far from any elephant who could give it to her. 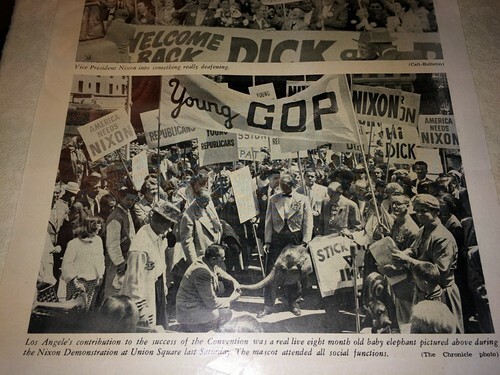 Four years later, by the 1960 presidential election, my mother had become a Democrat, firmly opposed to my father’s continued support of the Republican party. 1960 was the first election I remember: my 3-year-old self was so delighted that my candidate, John F. Kennedy, won. 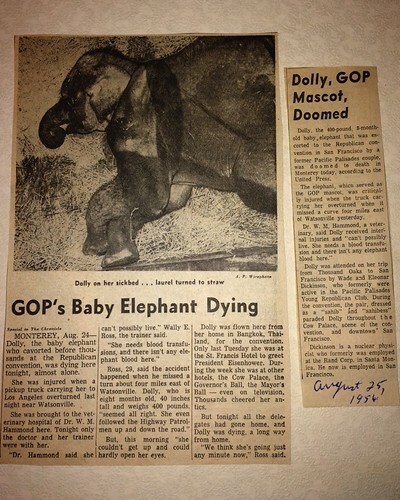 I wonder if Dolly’s death had anything to do with my mother’s shift in politics?